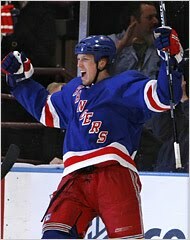 MARC STAAL IS A RANGER, for a multi-year deal - alleged terms for a five-year contract worth a reported $19.875 million (annual cap hit of $3.975 million). Short & sweet and just wanted everyone to have the good news. Just in time for camp. Geeze, I didn't expect it to be that much. In a way, I'm kinda not even sure he's worth that much. It's goes to show, even in hockey, brand names are everything. Have to agree with you J. Though, based on what was awarded to Girardi and his output, it seems reasonable from an agent's point of view. Compared to other teamate contracts, this is a friggin bargain as Staal is 'our only hope'.